Dr. Rezende has a PharmD degree, MSc and PhD degrees in Biological Sciences with emphasis in Pharmacology by the Federal University of Minas Gerais (UFMG), Brazil. In 2012 he finished his first postdoc in Immunology, also at UFMG and joined the Weiner’s lab for his second postdoctoral fellowship. Dr. Rezende’s primary goal is to understand the mechanisms underlying the immunological tolerance breakdown, a major factor that contributes to the development of autoimmune diseases. He is particularly interested in a subtype of T cells that express the gamma-delta (gd) chains of the T cells receptor (TCR) instead of the conventional alpha-beta (ab) TCR chains. He discovered a new subset of gd T cells that express the latency-associated peptide (LAP), a membrane-bound TGF-b that are involved in gut homeostasis control with the ability to suppress colitis in a mouse model of Crohn’s disease. 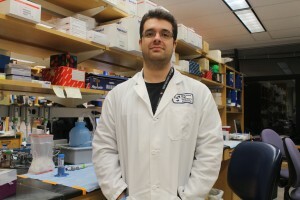 In 2016 Dr. Rezende was promoted to Instructor in Neurology and he is currently investigating the involvement of gd T cells in antibody production and antibody-mediated autoimmune diseases, such as systemic lupus erythematosus (SLE), and the role of gd T cells in shaping the gut microbiota and its consequences in oral tolerance induction.